We will cover $10,780 in costs for your first year living in a beautifully appointed residence within our boutique retirement living community. If you deposit between now and 31 July 2019, you could be eligible to pay no General Services Charge or Maintenance Reserve Fund (MRF) for 12 months. This offer is only available for the first 20 apartments that are secured. Don’t miss out and secure your new retirement living apartment within this virbant cosmopolitan precinct on the doorstep to Nundah Village. Complete with your very own concierge and in-house services. If you would like to organise a tour of our display apartment or find out more about this offer at Alondra Residences, please don’t hesitate to get in touch. 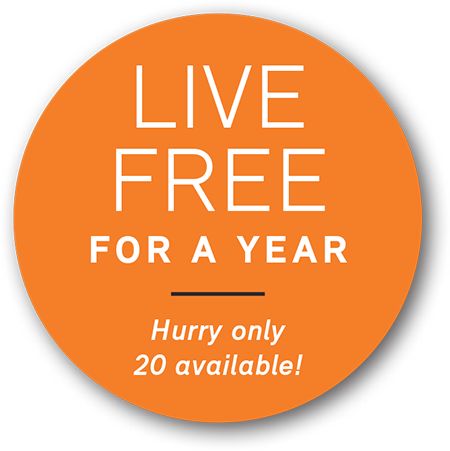 The Live Free for a Year Campaign will run from 1 February 2019 to 31 July 2019. To be eligible, a resident(s) must submit a signed Residence Agreement and pay the deposit for their apartment by 31 July 2019. Only one offer is available per retirement village apartment at Alondra Residences. Up to 20 offers are available in total, on a first-in-best-dressed basis. If a resident is successful, they will be excused from paying the General Service Charge (GSC) valued at $10,780. Resident(s) can elect to pay no GSC for 12 months, or a portion of the GSC for 24 months. Regardless of which option is chosen the value of the offer is limited to $10,780. The selected offer period will commence from the date the resident(s) move into Alondra Residences. the resident(s) move out of Alondra Residences within the selected offer period of either 12 or 24 months. The offer applies only to 20 retirement living apartments within Alondra Residences and is not applicable for any other Lutheran Services sites.